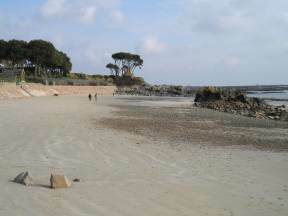 The sandy stretch of beach at Green Island is a favourite of many local people. It's easy to go past without noticing the entrance to the car park at Green island as the sign is rather small! If you're coming along the east coast road from St Helier, look out for the small, white-painted light tower next to the road. Shortly after this is a roadside car park. You can park here if the main Green Island car park is full, and then walk along the sand towards your left as you face the sea. For the main car park, continue along the main road past the newsagent, and look out for the small white sign on a lamp post to the right. You'll find the main car park for Green Island down here. The car park can get full very quickly on hot summer days, especially when the tide is high. You can get here by bus as well. The number 1 bus route runs along the main road. Green Island has a lovely sandy stretch of beach, as well as rocks and tidal pools to explore as the tide goes down. The small grassy mound of Green Island is surrounded by the sea at high tide. Evidence of early bronze age graves and even early signs of civilisation have been found here. You can walk out to the Island, but take note of the signs - it's easy to be caught there by the rising tide. There are toilets and a telephone kiosk in the car park. The small restaurant has a good reputation, and the kiosk sells refreshments and beach goods.